The construction sector across Ireland and the UK is currently experiencing a severe shortage of PIR insulation as a result of insufficient supply of Methylene Diphenyl Diisocyanate (MDI). But what is available to those companies unwilling to pay soaring the costs of PIR or those who cannot wait around for normal supply to return? 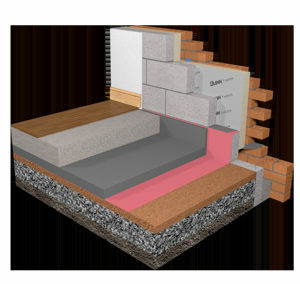 In the short term, builders could look at other viable options to replace PIR insulation with alternatives such as polystyrene for sub-floor insulation. This would allow the early stages of construction to proceed and hopefully get contractors past the current impasse. It is important that any changes are considered with the BER rating as a whole. Quinn Building Products can offer house builders a simple solution to help overcome the current PIR supply issues, that can save you up to €1200 on a typical semi-detached as an added bonus. By introducing Quinn Lite thermal blocks at a number of key junctions in the structure, we can calculate a thermal bridging factor, which is significantly lower than the default value typically used in BER calculations. By applying this lower value to the original BER calculation we can generally do a direct swap from PIR insulation to EPS insulation in the floor, without increasing the thickness of the insulation, which results in an automatic €400 saving. In addition, up to €800 can be saved elsewhere in the build by using a combination of reduced levels of insulation in the walls and the roof and a reduced level of renewable technology. Quinn building products have an experienced technical team on hand, who can provide you with all of the necessary calculations and demonstrate how any proposed changes from the original specification will still be Part L compliant. If the PIR shortage is causing issues for your company, get in touch and our team will guide you through your options. Jason Martin, Specification Manager, Quinn Building Products. This entry was posted in Building Regulations on August 9, 2017 by BRegs Admin.